Less than a year remains before Russia’s next presidential election in March 2012, but there’s still no solid confirmation of who from the ruling tandem will actually be in the running. During his recent visit to Russia, US Vice President Joe Biden told Russian Prime Minister Vladimir Putin that it would be less than prudent for him to seek a third time. 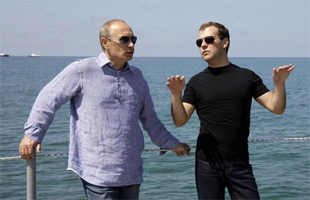 And the image of President Dmitri Medvedev as a temporary stand-in for Putin has long lost its relevance as Medvedev shows more and more how much he seems to enjoy the position. But the country’s leading political party, United Russia, dropped a bomb on the media today with news that it plans to support Putin in the election regardless. The ruling United Russia party wants Prime Minister Vladimir Putin to stand in the 2012 presidential election, a top party official said Thursday. “As for the party’s position on the 2012 elections, United Russia will orient itself on its leader Vladimir Putin,” said Yury Shuvalov, deputy secretary of the presidium of the party’s General Council, Interfax reported. Putin heads United Russia without being a member. Uncertainty over whether he will return to the presidency, which he held in 2000-08, or back incumbent Dmitry Medvedev has pushed factions of the political elite to weigh in on the issue. Both Putin and Medvedev have hinted they may run in the election, but each has said they will make the decision together.